Finally, the SSD industry is getting a little TLC. A painfully obvious pun, perhaps, but the arrival of triple-level cell flash memory in a mainstream SSD is such a big deal, we're willing to take the flack. That Samsung is the one to deliver it, however, is not a huge surprise. The Korean giant is currently cranking out world-beating kit in several segments, from smartphones to ARM chips and HDTVs. That includes pushing the boundaries of SSD tech. 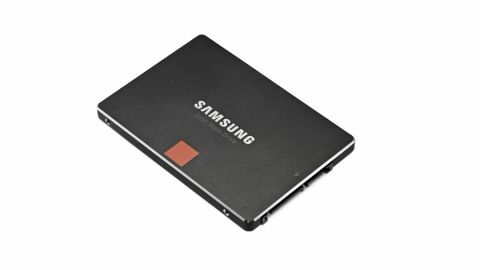 Samsung is pretty much alone these days in being able to bring together the key ingredients inside a solid-state drive. No other company does its own flash memory, controller chipset and even DRAM. It's the complete Samsung package. Of course, that in-house edge means Samsung can give itself first dibs with key developments. No doubt its new TLC memory will appear fairly soon in a wide range of SSDs from several brands. But here and now, it's unique to the new Samsung 840. The big win with TLC memory is, obviously, data density. The ability to store three bits per cell means an increase of 50 per cent over conventional MLC flash in terms of data density, and in turn promises a drop in SSD prices at a given capacity. The pricing part of the package hasn't happened immediately. But we doubt it will be long before the influence of TLC flash can be seen throughout the industry in the form of lower prices. Hurrah. However, there's more to TLC than mere capacity, and it's not all good. In very simple terms, TLC memory is both slower and less robust. It can't cope with as many write-and-erase cycles as MLC memory. That's probably why Samsung is reluctant to quote exactly how many of those cycles its new TLC chips can swallow. But really roughly, you're looking at around one third the longevity per cell of equivalent MLC memory. We also know that this new TLC memory has greater read and write latencies than MLC flash. Suddenly then, TLC doesn't sound like such a great idea after all. Sure enough, if you scan the spec sheet you'll find the new 840 is actually slower than the old 830 in some areas. Most notably sequential write performance, which drops from 400MB/s to just 250MB/s. Yikes. But the 840 is also faster in other areas, including peak IOPS which are slightly up for reads and almost doubled for writes. The poorer endurance rating probably isn't the disaster it first seems, either. Even a pessimistic calculation of longevity involving daily usage would put the likely lifespan at well over five years. Samsung provides a warranty for three years. As our benchmark results show, the 840's performance is pretty decent where it counts. It's competitive in our application tests and ponies up 4k random reads and writes that would have looked world-beating only a few months ago. That doesn't make the new 840 a must-buy proposition immediately. For that we'll have to wait for the price advantages of TLC memory to fully kick in. But this SSD is only going to get more tasty as the price tumbles.